Obstructive sleep apnea or OSA is a sleep disorder where a person stops breathing while asleep. This common and quite serious condition involves the airway becoming blocked and the lungs consequently receive limited amounts of air. Loud snoring and choking sounds could be an indication of this. The body and brain will feel a sense of oxygen deprivation upon waking. The number of times this can happen per sleep can vary wildly and can occur up to a few hundred times per sleep. This pause of breath (i.e. an apnea) is typically caused by tissue collapsing at the throat’s back. When you sleep, your upper airway muscles will relax and your tongue can fall backwards toward your throat when you sleep on your back. This means a narrowed airway where the tissue in the throat vibrates and creates a snoring sound. You can rest assured that not all snorers will have sleep apnea. Obstructive sleep apnea is usually diagnosed with a home sleep test or a sleep study that is done in a lab. Treatment involves either continuous positive airway pressure (CPAP) machines or oral appliance therapy. Keep in mind that sleep apnea has different symptoms and causes for children. Despite the misconception that an older, heavier man is more likely to acquire sleep apnea, anyone of any age, gender, or weight can suffer from this condition. Those that are even more at risk include smokers, males, and older people (over 40 for men and over 50 for women); having high blood pressure, a larger neck, and a family history of sleep apnea are also key factors that can make this condition more likely. Your possible treatment plan could include a combination of solutions from oral appliance therapy or CPAP machines to surgery or positional therapy. Weight management and a variety of other lifestyle changes such as quitting smoking, lessening your alcohol and sleeping medication intake, and having a regular sleep pattern can all be beneficial as well. In particular, continuous positive airway pressure or CPAP refers to machines that provide a gentle yet constant stream of air that ensures your airway stays open while you are sleeping. You essentially wear a mask that is connected to the machine that is providing the air with tubing. There are numerous options available depending on what you find comfortable and your specific case of sleep apnea. Oral appliance therapy, on the other hand, works like a mouth guard and alters your jaw and tongue placement for better breathing. 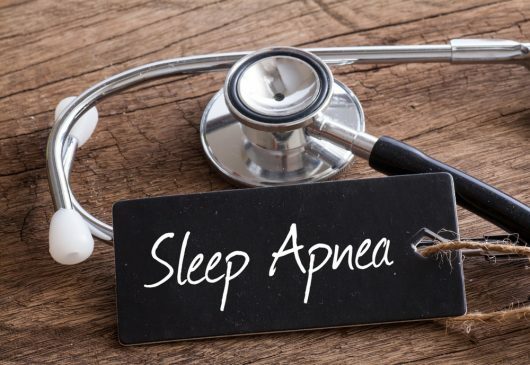 Whatever treatment you decide upon, it is important that you address your obstructive sleep apnea as soon as possible to minimize the risk of further issues. First test to find out if you have it and then follow through with the optimal treatment plan.